Occasionally, I still allow myself to be drawn into a showroom to have a chat with one of the young agents who passes out brochures. This is partly to keep abreast of prices, partly to see if anything is new in the showroom, and partly to see if there might actually be something worth buying. In summary, the developer in this case is selling a 26.04 sqm unit for Total price of P 7.22 million. That's P 277.3k per sqm. This price is 41% above the Makati Prime price index for Q2.2018 of 195,950. PA: (Property Agent) That's because it will be completed in 202?, and prices will be a lot higher then. PA: Prices always go up. They have risen every year since I have been in the business. They should rise 10-15 p.a. Me: (with a chuckle.) Maybe you are too young. Do you know what happened in 2000-2004? the next 4 years, that is a long time. Prices can drop and go back up again. Shall I explain the payments?. The payments are really Low, only about P22,500 a month. That's just US500. Most people can afford that. And there's no interest for you to pay. Every payment reduces your balance due. Me: (chuckling) You want me to pay interest before you even hand the unit over? That's crazy. No one is going to pay interest on a property where the developer is still building the property. PA: Our developer pays interest on the bank loans he takes to build the property. Me: Sure, but you price the financing cost into the Total Price you charge for the property, right? on the whole property, including the 85% you have not paid for. The Agents all want to talk about payment structures. But that is not what I want to talk about. BTW, I might pay cash, if the cash discount is big enough. over all the years I own the property. PA: (Shocked, since no one ever asked this question of him before.) The rent should be higher than today, sir. Me: Do you know what yields are today? (agent shakes his head.) About 5 -6% Gross Yield, if you are lucky. PA: But rents will rise, sir. They rise every year. Me: No, they don't. They fell in 2000-2004, and they fell again for luxury flats over the past two years. PA: You are the first one to tell me that. My clients say it is easy to get a tenant now, sir. were just a few years ago. And interest rates are starting to rise. My target is to get a Gross Yield of 8-10% pa.
What are you projecting for this property? PA: I don't know, sir, but it should be easy to rent. It is a convenient location. That's okay, I will do it. Let's use P1,000 psm. That might be reasonable now, with the chinese demand. or less than half my target return. PA: (disappointed) Rents will rise, sir, but you may not get that here. what they were back then. The numbers just do not work for me at all now. and if they can afford it. Me: Okay. So, I will wish you good luck with the properties you have for sale. Thanks for your time. 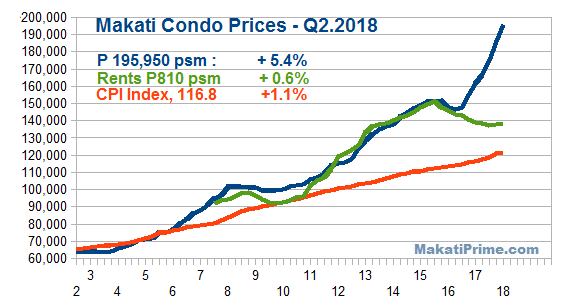 The Colliers report changed the data for Q1, and so I changed my Condo price too, from 180,400, to 185,825 psm for Q1.2018. That is up 6.45% for the quarter, instead of 3.3% - roughly twice as much a rise. These big price rises are pushing yields down, since rents are hardly rising. Note the big decline from the 212% ! increase... to just +78%. Is the scary jump in Supply behind us?? ========= : End'16 : End'17 : -2018 : -2019 : -2020 : '18-20 : End'20 : % chg.
========= : End'16 : -2017 : -2018 : -2019 : -2020 : '17-20 : End'20 : % chg.
Rise/Air Res: 00,000 : 0,000 : 0,000 : 0,000 : 6,400 : 06,400 : 06,400 : Infin. Manila Bay : 08,800 : 5,500 : 8,500 : 2,600 : 2,100 : 18,700 : 27,500 : +212% !! USDPHP may have peaked, according to this analyst. 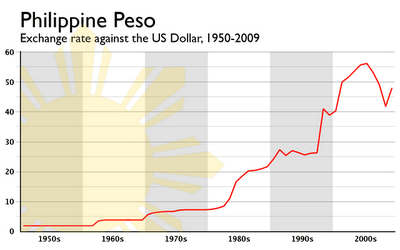 After the Singapore Dollar, the Philippine Peso could be next to witness gains against the US Dollar. This is because we have an evening star bearish reversal formation at the most recent peak in USD/PHP. In addition, negative RSI divergence warns upside momentum is ebbing. However, do note that the rising trend line from August still holds. A descent through it exposes horizontal support at 53.74. Meanwhile a resumption of the dominant uptrend has USD/PHP eying 54.49 next. Seven percent inflation in the Philippines could be around the corner. More than half a million metric tons of paddy rice were wiped out by Super Typhoon Mangkhut last weekend, adding pressure to rice prices which are already at a record. Michael Enriquez, chief investment officer at Sun Life of Canada Philippines Inc., forecast inflation of as high as 7 percent in September, from 6.4 percent last month, which was the fastest pace since 2009. The typhoon couldn’t have come at a worse time for the Philippines, with soaring inflation and a currency slump of more than 7 percent against the dollar this year prompting the central bank to hike interest rates by 100 basis points since May.
. . . ING Groep NV warned that rice prices, which have risen more than 20 percent this year, will soar even more. Inflation may be higher than 6.5 percent in September, Nicholas Mapa, senior economist said in a note Wednesday. The September data is scheduled to be released Oct. 5. Government officials are rushing to implement measures which include easing importation of rice and sugar, but the impact on prices may only start after October, Sun Life’s Enriquez said. Inflation will peak this quarter and start easing in the next few months, central bank Deputy Governor Diwa Guinigundo said this week. Bangko Sentral ng Pilipinas has pledged to deliver strong action at its Sept. 27 policy meeting. 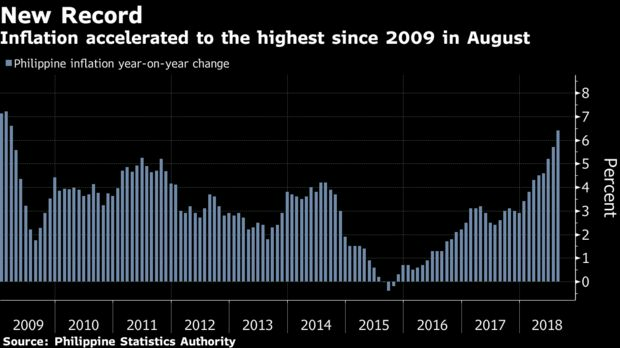 The central bank’s residential real estate price index (RREPI) rose by 4.8 percent to 117.2 in the second quarter from 111.8 in the same quarter last year. The BSP said the average price of townhouses booked a double-digit increase of 13.3 percent, followed by condominium units with 9.1 percent and single-detached housing units with 0.6 percent. Costs to acquire homes grew faster at 5.1 percent in the National Capital Region (NCR) as higher growth in prices of condominium units and townhouses offset the decline in prices of single-detached houses and duplexes.
. . . 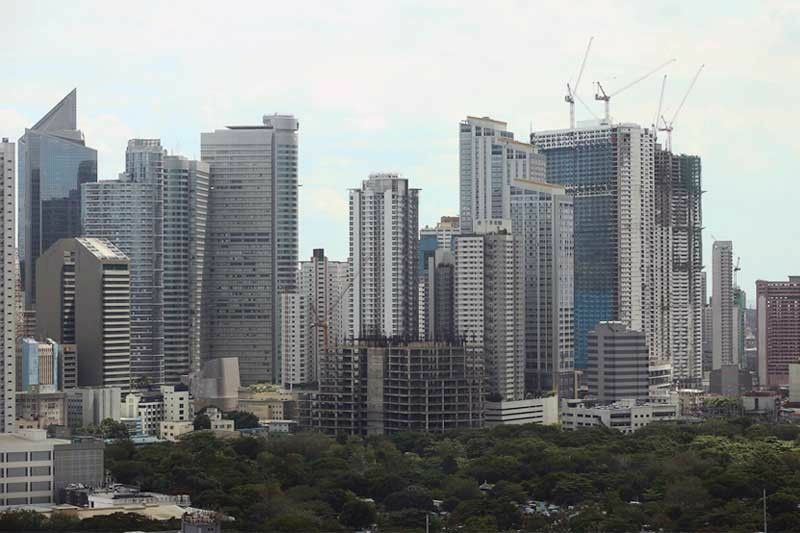 In the second quarter, the BSP said about seven in 10 or 77.1 percent residential real estate loans were intended for the purchase of new housing units. By type of housing unit, 46.1 percent of residential property loans were for the acquisition of condominium units, followed by single-detached units with 45.6 percent and townhouses with 7.8 percent. JLL 3Q 2018 Property Market Overview is online. + Taguig city will see a moderate increase during 4Q2018 and a rather large increase in 2019. In 2020 the supply increase in MAKATI will be twice that of PASAY+TAGUIG combined. Their forecast is for 76,800 new residential units to hit the market FROM 4Q2018 until the end of 2020, of which 23pct will be for MAKATI and 23pct for PASAY city so 17,600 new units will be added in each of both districts 4Q2018 until end of 2020. In terms of rents, surprise here, the median rent is already higher in PASAY city than in MAKATI city. The rent varies between PHP1,100 to PHP1,700 per square meter in PASAY, so the average is PHP1,400 while the rent varies between PHP510 and PHP1900 per square meter in MAKATI district, so the average is PHP1,200. For taguig city the average rent varies between PHP600 and PHP1500, so average PHP1,050. Yes that is what I noticed also. Taguig and BGC are not popular with the Chinese, Chinese like the sea and the area of Makati that borders PASAY, (chino roces). Even buildings like San Lorenzo Place on Chino Roces command higher rents than similar Avida style buildings in BGC. BGC is really having a hard time getting good rents. I see the same thing on rentpad. The asking rents for buildings in BGC are too low, compared to buildings in PASAY/MAKATI. For the moment, BGC is the trainwreck. And they're launching new towers costing PHP300K + per sq meters. ""IN 3Q2018 rental rates in PASAY CITY move up, ranking second to MAKATI city, primarily due to employees of Chinese online gaming companies. Landlords are asking higher rates due to the willingness of Chinese companies to pay at initial asking rates to house their employees"
It now remains to be seen how the big supply increase will be absorbed by the market. According to some commentators thousands of condos are needed in the bay area to satisfy the new demand. Everything will -primarily - depend on the growth of online gaming in China. And another warning for MAKATI. Big supply increase is coming in 2020. So the pain will be felt everywhere. BGC rental rates are low but except for a little spike in 2019 relatively little new supply is coming available. Pasay CITY will experience a massive supply increase starting now for 5 quarters, while MAKATI will be hit in 2020. P 1,400 psm for Pasay? Really? "Chinese are accepting Asking prices"
Your reasoning looks faulty to me. BGC has also welcomed many multinationals and large corporations setting up their new HQ in BGC. The likes of GOOGLE, You tube, Megaworld, DB, Citibank, HSBC and so many others. However, the expected "uptick" in rental prices did not materialize as of today. Why would there be an "uptick" in prices when AFT is completed? It is exactly the same thing that will happen in the "HOT AIR" district of Makati. Why would the outcome be different this time??? Most of the tenants in those buildings will pay the locals just a very small salary. It won't be enough to break the downward spiral in rental prices. The reality is that it is the Chinese who pay and sometimes over pay, and their favorite spot remains the Bay Area. Some of them are now even contemplating setting up factories in PH to avoid the US-China trade sanctions/tariffs. In other words, Makati can become another "pearl harbour". When all these flats will be completed in 2020, it will be a total devastation for existing landlords. Better sell now while the market still "appears to be " reasonably strong. "Why would there be an "uptick" in prices when AFT is completed?" 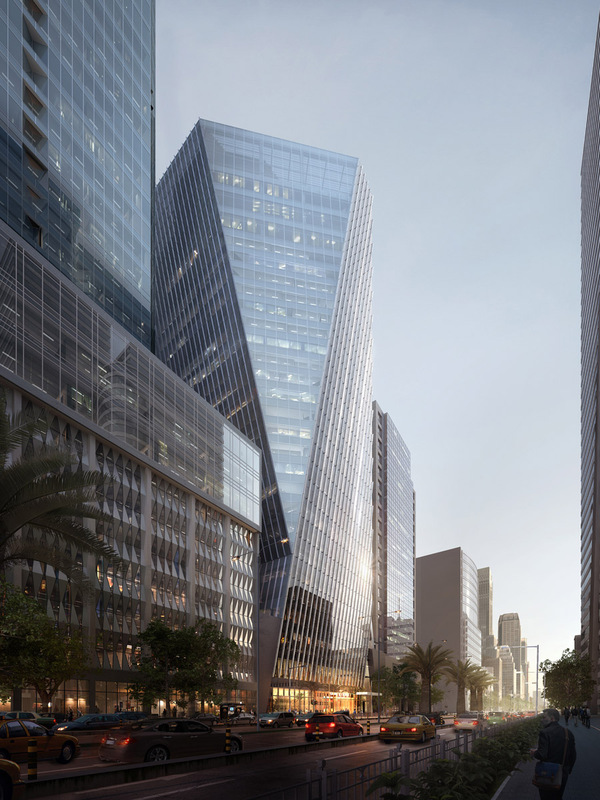 AFT/ Alveo Financial Tower is not going to be completed for 2-3 years. That is FUTURE employees. But the impact NOW is coming from Offices completing now, at the end of 2018. By contrast, BGC has seen a rise in Office Completions, together with a massive rise in Residential Condo completions in the Fort & McKinley area - as I have previously documented. The Condos are running ahead of the Office jobs in BGC. Hence the softness in rents. "it is the Chinese who pay and sometimes over pay, and their favorite spot remains the Bay Area"
A favorite spot? Perhaps because they have jobs there, in double and triple shifting companies that operate with changing shift times, so they have to live nearby. 3 property research companies - Colliers, JLL and Knight Santos Frank - and three completely different reports. As usual, KSF is the most bullish amongst all 3. And JLL sees a huge supply increase in Makati in 2020 which Colliers doesn't report. And then the real shocker: BGC vacancy rate going from 15pct to 16pct. The lower band of rental rates in BGC dropped sharply. From PHP620 per square meter to PHP530 per square meter. That is down 15pct. 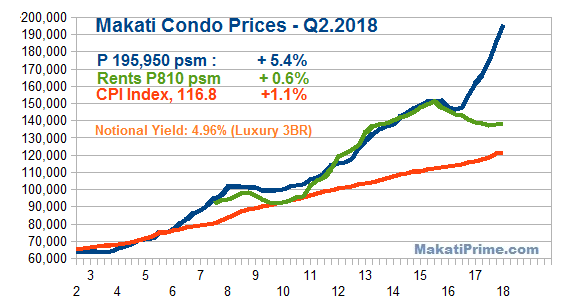 And a 1pct decline in rental rates for Makati. In terms of rental income, BGC is the first train wreck. Avida is the lower band supplier of buildings in BGC and investors see their projected income decline. It is the same what I see based on data from rentpad from Avida 34th street and Avida Verte. Rental rates are plainly awful. Horrific. I will try to highlight that in the data section at a later point in time but it doesn't look good. Thanks for those comments, ECB. A 30 storey and a 40 storey Tower at CityGate: 1 & 2. Plus a 40-something building called NEX Tower. Tenants have just begun moving in a Citygate, and they should start moving into NEX before year-end. I expect maybe 20,000+ jobs in these buildings, and that is pretty good match for the 10,000+ beds (my guess) at Rise & Air, with 6,400 units in total. 2Q /2018 : 195.9k : 5.20% 0,810: +0. ? ?%: - 0. ? ?% / 0,5 ?? - 1,? ?0 / 0,6 ?? - 1,? ?0 / 0,7 ?? - 1,? 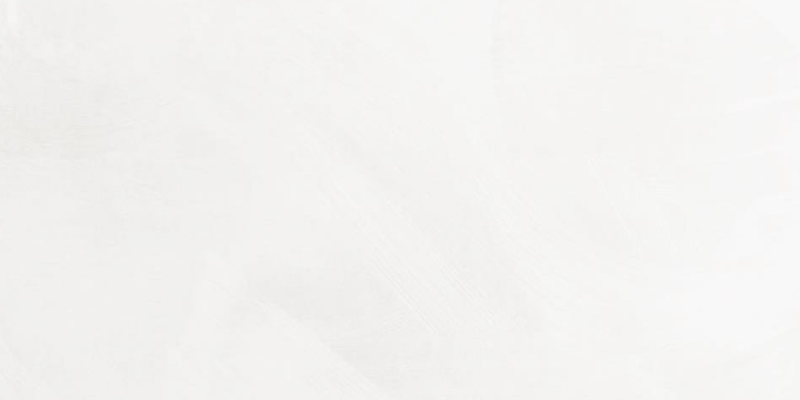 ?0 : ? 1Q /2018 : 203.3k : 4.83% 0,819: +0. ? ?%: - 0. ? ?% / 0,5 ?? - 1,? ?0 / 0,6 ?? - 1,? ?0 / 0,7 ?? - 1,? ?0 : ? 1Q /2018 : 185,800e +?. ? ?% : + ??. ? % : 111,700- 260.0k* : 114,000 - 244,400 : 200,400 - 247,300 : *286.4k x90% adj. 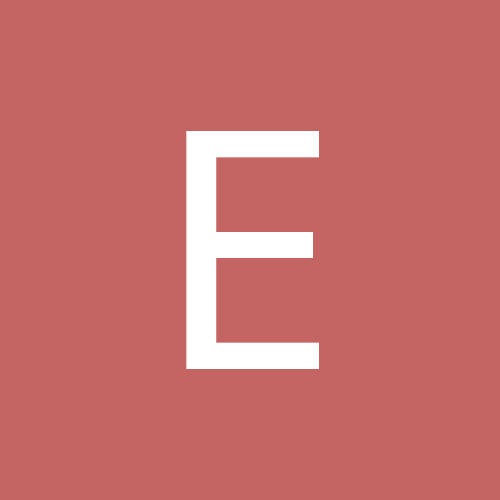 2Q /2018 : 195,950e +?. ? ?% : + ??. ? % : 121,000- 270.9k* : 118,000 - 252,000 : 199,000 - 246,000 : *301.0k x90% adj. 3Q /2018 : 203,350e +?. ? ?% : + ??. ? % : 125,000- 281.7k* : 124,000 - 264,000 : 208,000 - 250,000 : *313.0k x90% adj. Philippines has fallen to #99, in a Tie with Thailand - in the Global Corruption rankings. Interesting contrast in Office VACANCIES... Bay Area = 0.4%! Makati = 1%. BGC= 7%. + "BGC office space rentals too expensive? heard they are also occupying office space in Alabang and Cebu"
Probably it is the cost. but rents were up 19% for Manila Bay offices last year. Another issue is the difficulty in getting in and out of BGC. 3 months in a row of declines. Lower than 4.5% median estimate. Colliers is revising its forecast of condominium price increase from 2019 to 2021 upward to 5pct yearly from the previous 3pct. WOW. There you have it. PHILIPPINE REAL ESTATE WILL NEVER GO DOWN IN VALUE. The new safe haven currency?? Haha, Things get really risky when everyone starts thinking like that. First Philippine subway seen pushing up property prices in Metro Manila. 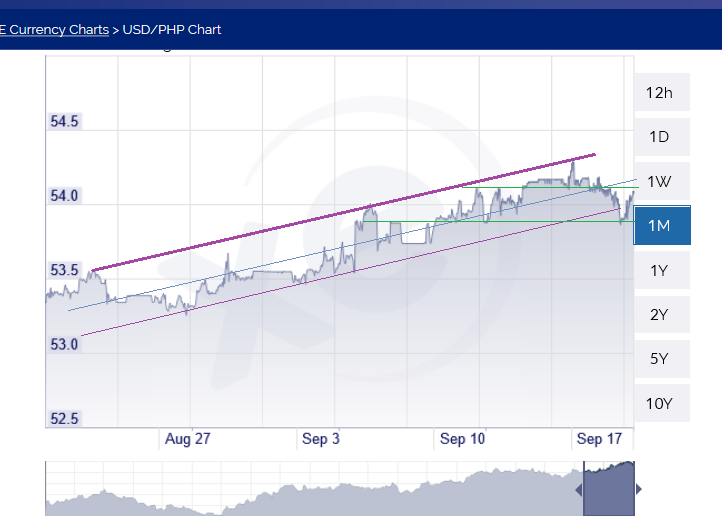 Based on the chart below, technical analysis points to the peso ranging between 51.50 and 53.50. A break below 51.50, however, would lead to a possible move towards the 50-level.